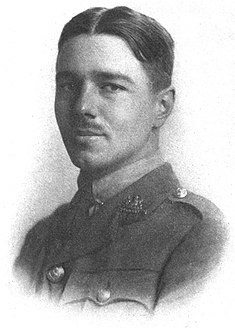 Wilfred Edward Salter Owen, MC (18 March 1893 – 4 November 1918) was an English poet and soldier, one of the leading poets of the First World War. His war poetry on the horrors of trenches and gas warfare was heavily influenced by his mentor Siegfried Sassoon, and stood in stark contrast both to the public perception of war at the time and to the confidently patriotic verse written by earlier war poets such as Rupert Brooke. Among his best-known works – most of which were published posthumously – are “Dulce et Decorum est”, “Insensibility”, “Anthem for Doomed Youth”, “Futility” and “Strange Meeting”. Wilfred Edward Salter Owen, MC (18 March 1893 – 4 November 1918) was an English poet and soldier, one of the leading poets of the First World War. His war poetry on the horrors of trenches and gas warfare was heavily influenced by his mentor Siegfried Sassoon, and stood in stark contrast both to the public perception of war at the time and to the confidently patriotic verse written by earlier war poets such as Rupert Brooke. Among his best-known works – most of which were published posthumously – are "Dulce et Decorum est", "Insensibility", "Anthem for Doomed Youth", "Futility", "Exposure" and "Strange Meeting".